IAMR aims at nurturing the talent of young boys and girls by providing them high quality education. IAMRs vision brings a global perspective to all its activities. Driven by this vision, IAMR has constantly endeavor to grow and consolidate its global network. Our aim is to incorporate the world’s best academic practices into our programmes, namely our management and executive programmes. As IAMR’s vision has taken shape and grown. Quite naturally the people associate with IAMR College have also grown in tandem. Our highly experience faculties have increasingly work on research problems as well as research orient consulting. And have made significant contribution to know-how world-wide. Our bright young students have develop their minds and have embark upon promising careers in the Science and Technology. 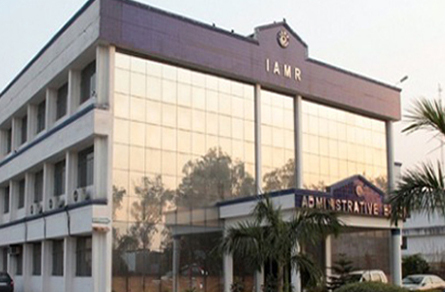 The executives who have been train at IAMR College have develop their latent managerial and leadership capabilities, and several of them have made it right to the top in their respective organizations. To train professionals by imbibing skills, competence. To-generate new knowledge by engaging in research on the frontiers of Science and Technology, adaptable for use by the common man. Undertake collaborative projects and consultancy with industry & to transfer the technologies thus develop. To provide an environment conducive for the professional growth of the faculty. IMAR Admission Eligibility Criteria Candidates seeking admission to the BBA Specialization Programme must have pass 10+2 (or its equivalent) examination from a recognize Board/ University.